The Australian National Register of Environmental Sensitivities (ANRES) Purpose We aim to create a national register of those who experience environmental sensitivities so that we can communicate our needs to the decision-makers as a group. To raise Awareness of Environmental Sensitivities by gathering data from people with Environmental Sensitivity Conditions. Provide support to a sufficient number of ANRES Members for them to feel heard and understood, and hopefully to join ANRES. To acquire a database of Registered Environmental Sensitivities from ANRES Members. This will develop into a large enough group to have an impact on government and other agencies. To provide relevant and accurate information on Environmental Sensitivities to appropriate stakeholders such as sufferers, carers, doctors etc. We aim to be a resource for the support associations and organisations in order to assist them with their work and application for grants. We, too, are a volunteer-run group. If you are wanting to get involved at ANY level, be sure to let us know. This is not a government action but an independent initiative to gather data in the hope of influencing government decisions. To facilitate privacy in Registration of your environmental sensitivities your name and email are optional fields. If you do add your name and email, be assured that we will not share your name or email address. To show your support become a member of the ANRES website. We won’t spam you or share your email address, but will occasionally contact you with updates, surveys or to ask for volunteers. The prevalence of Environmental Sensitivities is largely unknown in Australia. 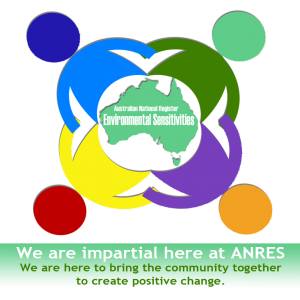 ANRES (Australian National Register of Environmental Sensitivities) aims to provide the background evidence to highlight the need for recognition and assistance. Statistics are needed for reform, particularly at a political level. Secondly, register your environmental sensitivities by following the link below or menu on the right of the page so you can contribute to the recognition of these medical disorders. Persons who register on this site will not be individually identified, their data kept private and secure. The register includes conditions such as Multiple Chemical Sensitivity, Chronic Fatigue Syndrome/ME, Fibromyalgia, Lyme disease, electromagnetic hypersensitivity (EHS) and food intolerances. Many of these conditions co-exist. For example a person with MCS may also suffer CFS and food intolerances. It is important to collect this information to determine the overall impact on health and lifestyle. Collecting numbers will not bring about immediate changes but it is the first step in gaining recognition of environmental sensitivities, which are largely invisible functional impairments or disabilities. We need to create the will for action.